Anyone going on board an Austin Parker 64 Fly S will find their gaze running freely all the way to the bows, with no obstructions. 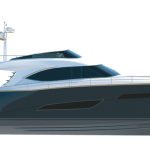 This is thanks to the simplicity Fulvio De Simoni has made the keynote of the design of this 19 metre craft, with its impeccable, restrained elegance. The sofas in the cockpit and main saloon are placed against the walls, leaving plenty of room to move around. The same applies in the galley, definitely one of the most innovative parts of the boat, and at the control console, shifted to the right to leave room for the companion-way leading to the lower deck.